Gotta’ love this great candid shot as the bride and groom were presented for the first time as husband and wife. The joy on their faces is amazing as they walked down the aisle and headed to their cocktail hour and dinner reception. This day started as the bride, her maid of honor and bridesmaids got ready in the bridal suite at Danford’s Inn in Port Jefferson, New York. 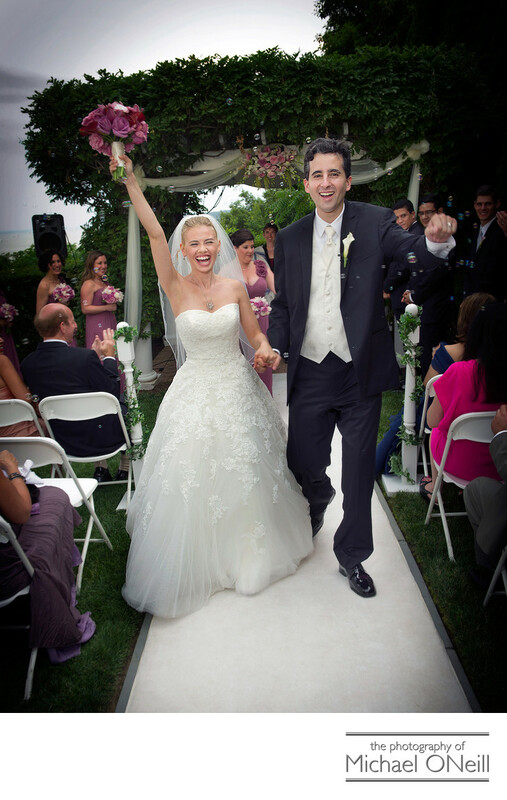 The top floor waterfront bridal suite has a private balcony overlooking Port Jefferson Harbor. The bride descended from the bridal suite and the reveal took place in the quaint area of the shops at Danford’s. The look on the grooms face when he saw his bride in her wedding dress for the first time was incredible. We then walked with the bridal party to the village park on the water where we took lots of wedding photos. Another stop was made, for more pictures, at The Village of Belle Terre offices which features a beautiful tudor style building and an impeccably manicured green lawn. Then it was on to Lombardi’s on the Sound at Harbor Hills for the outdoor wedding ceremony overlooking Long Island Sound. The ceremony was followed by one of Lombardi’s legendary cocktail hours and the dinner reception in the grand ballroom.